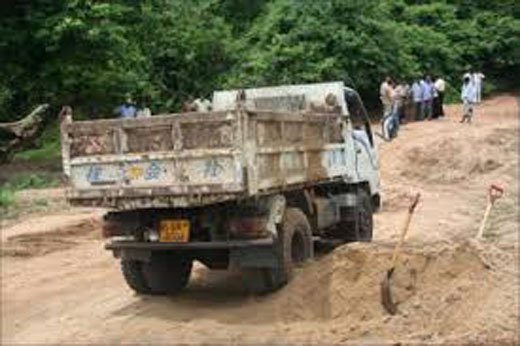 Mangaluru, Jan 23,2016 : As per official reports, DK - Dakshina Kannada district administration has decided to leave no stone unturned to check illegal transportation of sand to other states through the district. All checkposts will be under CCTV surveillance to monitor the movement of trucks and other heavy vehicles that transport sand illegally. The administration has started the process of tender for e-procurement of equipment required to put the surveillance system at all entry points.Department of mines and geology in-charge deputy director KS Nagendrappa sated that they have identified nearly 30 spots on the border areas of Dakshina Kannada.
" DC Ibrahim has directed to install CCTV cameras to prevent illegal transportation of sand to Kerala. In two weeks all these points along the Karnataka-Kerala border will be equipped with CCTV networks," Nagendrappa pointed out. He said police will monitor truck movements. "The Dakshina Kannada District Task Force on Sand Mining has decided to hand over the responsibility of monitoring CCTV footage to the police. They will monitor the footage and take action based on the information," he added, there are 242 permit holders to extract sand from 232 acres of sand mining areas in Dakshina Kannada district. In spite there Sand mining being the business is talking place because this business is the main income to the political leaders.